A collection of items I found insightful, thought-provoking, or just plain funny. from Michael Crichton's speech to the Commonwealth Club, September 15th, 2003. Incidentally, the people he is castigating for these beliefs are modern environmentalists. Punk was also the first white rock music to confront the racial divide and take it as a fact of life. Though scarcely a racist, Joey Ramone was nonetheless the first white rock singer to not even pretend to be black. from Condon Sanitaire by Seth Sanders and Mike O'Flaherty, in The Baffler #15. The First Law: All human behavior traits are heritable. The Third Law: A substantial portion of the variation in complex human behaviorial traits is not accounted for by the first or second laws. Written by Eric Turkheimer in his article that begins with the sentence "The nature-nurture debate is over"; as quoted by Steven Pinker in The Blank Slate. In explaining the three laws, Pinker notes that the second law is quite generous; the effect of being raised in the same family on adulthood behavorial traits is actually close to zero. "I remember feeling very odd catching snippets of the Madison Square Garden benefit concert, watching bands that had once scoffed at the integrity of any culture, let alone their own. Rock, since it's inception with Elvis, has always undermined the foundations upon which a culture can claim its coherence. … if the concert signified anything to me in terms of music it was the end of rock." "While Pizacatto Five, Cibo Matto, and Cornelius continue to release records here, the sort of fascination they elicited from Americans mesmerized by the distorted reflections of their own culture has thinned in a world where the integrity, not distillation, of culture has become essential. This might partially explain why a collection of Despression-era folks songs, the soundtrack for O Brother, Where Art Thou, outsold pop divas and princes … "
 Yuji Oniki, from PULPman Profiles 13: Buffalo Daughter, Aug. 2002 Vol. 6 No. 8 issue of PULP magazine, alas the final issue for the publication. Legions of Italian, Irish, Poles, Jews from all over, were in place, relying for work and shelter not on the public purse but on support groups of earlier arrivals from their home country, region, or town. Many native-born citizens thought them dangerous, crowded together in ghettoes, clinging to their exotic religions - even, for a time, languages - and carrying the whiff of socialism. A centry later, their descendants, living now in detached houses in tree-dotted suburbs, filled all branches of government and dominated the country's culture, a culture known worldwide as "American". It's said the in the early years of this century, Charles Steinmetz, the great electrical engineer, was brought to General Electric's facilities in Schenectady, New York. GE has encountered a performance problem with one of its huge electrical generators and had been absolutely unable to correct it. Steinmetz was brought in as a consultant  not a very common occurrence in those days. Steinmetz also found the problem difficult, but for some days he closeted himself with the generator, its engineering drawings, pencil, and paper. At the end of the period he emerged, confident that he knew how to correct the problem. After he departed, GE's engineers found a large "X" chalked on the side of the generator casing. There was also a note instructing them to cut the casing open at that location and remove so many turns of wire from the stator. The generator would then function properly. And indeed it did. Steinmetz was asked what his fee would be. Having no idea in the world what was appropriate, he replied with the absolutely unheard-of answer that his fee was $1,000. 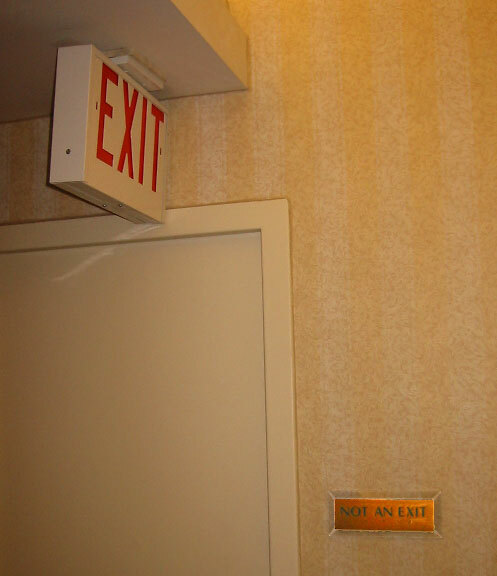 This is a actual picture from the Wilshire Grand in Los Angeles (contrast tweaked for legibility).